Originally published by Paris-Luttes. Translated by Libcom. Our vests are no longer road safety suits; they have become a rallying sign to the movement that globally challenges the established order. The reason they twinkle is not to alert the authorities on any emergency or social distress. We didn’t put them to demand something to the Power. The yellow of our vests is not the yellow that is usually attached by the workers’ movement to treachery. The colour of this garment is that of the lava of anger that the volcano of social revolution, which has been dormant for too long, is beginning to spew out again. It is only yellow because it embraces red. Under this name “yellow vests”, a titan barely wakes up, still groggy from the coma in which he was plunged for more than forty years. This colossus no longer knows his name, no longer remembers his glorious history, and no longer knows the world where he’s opening his eyes. Yet, as it reactivates itself, he discovers the magnitude of his own power. Words are whispered to him by false friends, jailers of his dreams. He repeats them: “French”, “people”, and “citizen”! But by pronouncing them, the images that come back confusingly from the depths of his memory sow confusion. These words have been used in the gutters of misery, on barricades, on battlefields, during strikes, within prisons. It’s because they are from the language of a formidable adversary, the enemy of humanity who, for two centuries, has masterfully handled fear, force and propaganda. This deadly parasite, this social vampire, is capitalism! • In this context, which puts the emphasis on the economic balance as long as it is well managed, what is wrong with the economy can only be brought from the outside: the tax State, the European Union, the “cosmopolitan” “Finance” (and behind that, it is sometimes the “Jews” and “illuminati” who are referred to), the immigrants. The misunderstanding or the refusal to admit this glaring truth that capitalism – as a system producing wealth from the exploitation of human labour – is in crisis, leaves ample space for reactionary forms of safeguarding the prevailing order. 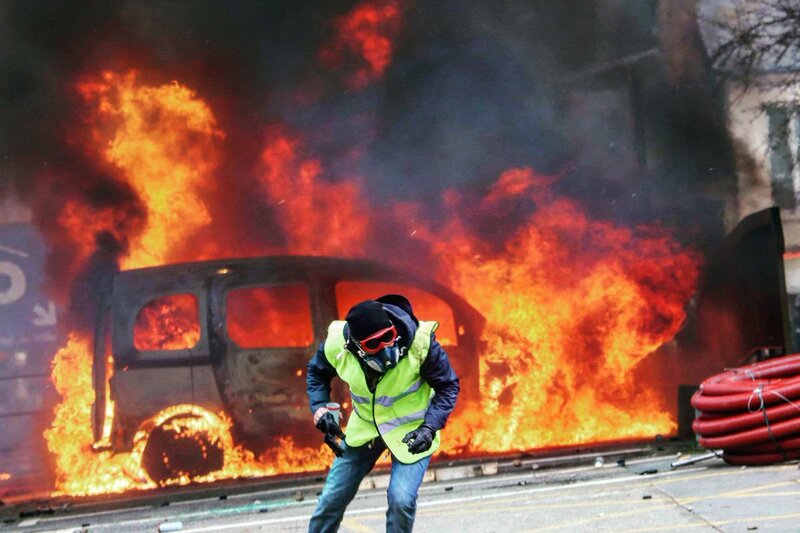 Ten years of far right activism on the Internet put a lot of pressure on this suicidal state of confusion in which many yellow vests believe they can see a solution to their suffering. • Among these “solutions”, the Citizens’ Initiative Referendum, promoted for a long time by the “fachosphère” [“extreme-right influence groups, mostly on internet and social networks”] and that ended up bringing together Mélenchon’s followers, is a hoax that allows the social question to be suppressed under an institutional grub. This democratic arrangement would not solve anything, even if it were adopted. It would just stretch the electoral elastic while maintaining the relation between social classes – its conditions as well as its stakes – with an extra strengthening of legal reformism, that poor relation of the already illusory economic reformism. It would be tantamount to a more direct endorsement of ordinary enslavement. • To want to break the ideological, managerial and trade-union shackles keeping the yellow vest movement out of the production process. We must use the extraordinary as well as determined force developed by this movement to achieve what millions of exploited people have wanted for so many years, without ever having succeeded in doing so: to paralyse production from within, to decide on strikes and their coordination in general assemblies, to unite all categories of workers, with the same objective of overthrowing the capitalist system and re-appropriating the production apparatus. Let’s put an end to hierarchical, capitalist and State oppression.